Beverly notified me of Wilbur’s passing, and I figured you said something on the website, too. All the family should be very proud of how Wilbur made that album in 1945 along with Bob McKean, and that you put it all on the web. Several people have been added to the mailing list for the group after being found via the comments made at your website. Wilbur and McKean both remembered my Dad and were generous with their time after I found them. Thanks, Tom. Please keep in touch. I want to offer my sincere condolences on the loss of your father. 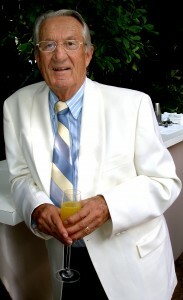 I lost my dad, Rudy Sellati, back in Dec. 2008. His service in the 286th CEB was wonderfully highlighted in the most recent issue of Wisdom News. 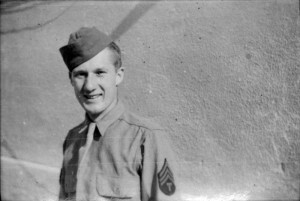 However, it was through your website and especially your dad’s 1945 album that I “found” my dad as well. Where it not for the 1945 album and this website I and my siblings would have remained in the dark regarding our dad’s service with the 286th during WWII. Thanks again for your efforts and those of so many others to honor the service of these brave men through your online activities. I am so sorry to hear of your dad’s passing. My thoughts are with you and your family. I am so appreciative of this website. As Tim said I ‘found’ my dad (Talis Munther) here too. He died when I was 14 and, at that point, hadn’t talked about about the war. Through your work, I have insight into his time in the 286th, some of his experiences, and the men he knew. Thanks, Tala. I appreciate it.